You may have noticed a layout change on this blog. I finally implemented a more modern CSS using Skeleton. Here’s what Skeleton has to say about itself. I totally agree. You can now resize this blog – see how the highlights on the left disappear as the window gets really small. This makes it actually readable on a mobile device – I tried it on my Android and it was a massive improvement from the old view! The implementation was very straightforward, most of the time was spent battling the ASP.NET grids and lists that are primarily table-based. This blog’s code is here if you care. Please also do let me know if something doesn’t work or can be improved. 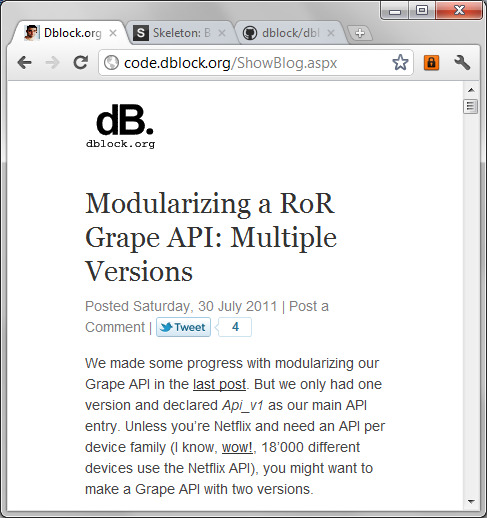 DBlog: Implementing Skeleton CSS Boilerplate was published on August 02, 2011 . See a typo?